If you’re an aspiring writer looking for opportunities, new connections and wanting to be found on the web, then I do recommend having a presence on LinkedIn. Although it has many of the trappings of a social network, it’s actually the least social. You can join interest groups, start or join discussions, post updates, connect with people and all the rest. But you can also just set up your profile page and that’s it. There’s no huge obligation to do a lot more, unlike say Facebook or Twitter where no activity can seem like you’ve abandoned ship. Whether you like it or not, LinkedIn is the go-to place on the web when checking out a person’s professional background. It has helped me out many times when I’ve wanted the real story about a person or a company, not the hype. 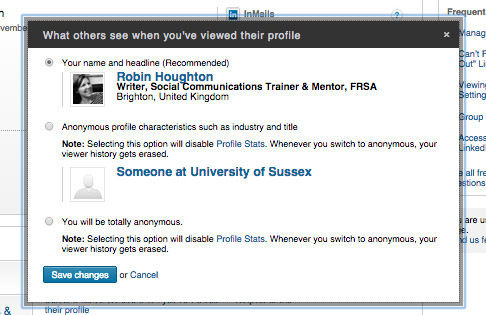 LinkedIn encourages you to fill in all areas of your CV, and make them public. It’s funny how a quick glance at a person’s background often tells you everything you need to know, and then some! If the thought of laying yourself bare on LinkedIn makes you nervous, not to worry – you can control how much people see and who sees what. Having said that, there’s no point being on LinkedIn if you’re going to be overly cagey. Concealing more than you reveal can look suspicious! It’s worth spending a little time sorting out your LinkedIn privacy and profile settings so that you have them as you want them. 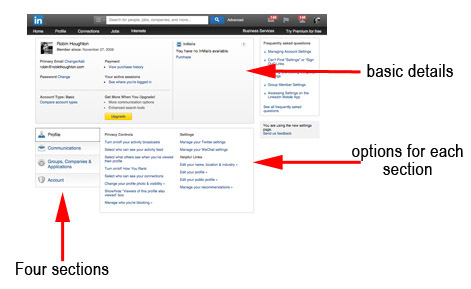 In the grey section top of page you can change or manage the basics of your account such as email address or password, or upgrade option. 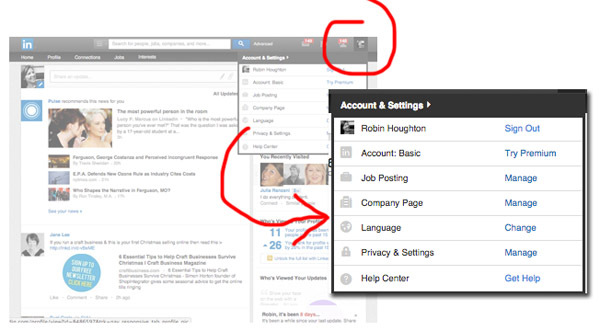 Bottom left is a menu with four sections – Profile, Communications, Groups, companies and applications, and Account. For now we’re looking at Profile, so click on that you see two columns, on the left is – Privacy Controls and on the right Settings and Helpful links. The left hand column is the one to focus on for now – I’m going to go through each item and explain what you need to think about. NB If you make changes don’t forget to Save Changes for each item you change. 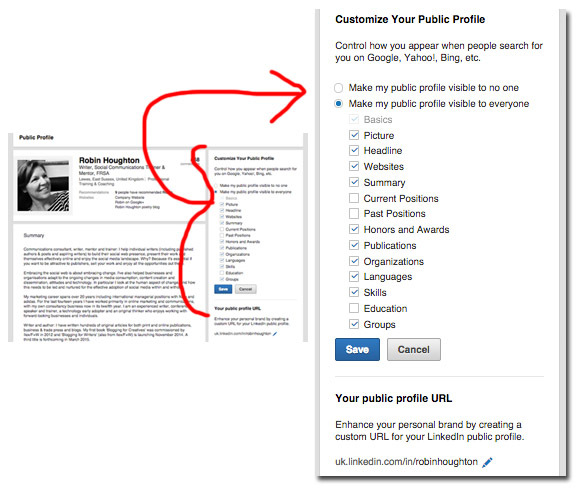 If you’re happy for everyone to see when you make changes your profile, make recommendations, follow companies or do other activity on LinkedIn, then leave this box checked. Not everyone wants their activity made public. But on the other hand, a change can be a prompt for someone to get in touch. If you’re tweaking your profile for keywords or trying things out, turn this off. Every small change will trigger a ‘broadcast message’ to your network. Only your Connections can see who else you’re connected to, it’s not publicly visible. However, any endorsements you have are visible. One of the advantages of being connected to someone is that you can see who they know – if there’s someone you want to contact you can request an introduction (although there’s no obligation for your Connection to agree.) If you’d rather people didn’t know who you knew, you can check the ‘Only me’ option here. Here’s where you can change not just your photo but all the other sections of your profile – Summary, Education, Publications, Experience and so forth. Your connections can see everything you publish here. But you can limit what is seen by everyone else (not connected to you) under your Public Profile settings – see below. There are two things that are easy to miss on this screen – first of all, just below and to the side of your photo is a blue button ‘View Profile as’. Click on this and you can check what parts of your profile are visible to different types of visitors. The other thing is next to this blue button – hover over the little arrow and several options are revealed. Basically you can select what bits of your profile are visible to people other than your Connections, and how much is revealed about you in web searches. You can also edit your public profile URL and make it something user-friendly. If you’re still using a URL with a load of number in it, why not change it to your name? Now go back to your Privacy and Settings page (yes, you might have to sign in again!) and there are three more things under ‘Privacy Controls’: they are Turn On/Off How you rank, which I wouldn’t worry too much about, Show/hide “Viewers of this profile also viewed” box and Manage who you’re blocking, both of which are pretty much self-explanatory. With any luck you won’t have to block anyone, but the facility is there – click on the option to find out more. Facebook was the first social network to introduce the big image banner on its profile pages, giving them a kind of blog-magazine look. Now it’s pretty standard – LinkedIn being the latest platform to roll it out. You can always stick with a standard old plain colour background or one of the free images that come with the platform. But why not create a custom image? Here’s a quick run-through of what you need to know. You can change your Twitter header image in the settings as shown here, or just click ‘Edit Profile’ on your Profile page. Facebook: (‘cover photo’) 851 x 315 pixels, minimum size 399 x 150 – but this will be stretched to fill. There’s a great Facebook Page that explains in detail the current different areas of the cover picture, how it scales on mobile devices and more, so if you want to make a precise job of it then take a look and download the latest templates here. YouTube Channel: (‘channel art’) 2560 X 1440 pixels. Refer to this helpful article to find out more, including how it will display on different devices. Google Plus: (‘cover image’) Max size 2120 x 1192 pixels, minimum 480 x 270. However, to ensure maximum quality on all screens, tablets or smartphones, the recommended size is at least 920 x 250 px but not more than 1080 x 608 px, otherwise some of the information will get lost. Here’s the Google+ step by step guide to uploading or changing your cover photo. 2) Check out what others are doing – find some striking examples of header images and get inspired. 3) Decide on what you want the image to convey. This is your showcase – what do you want to get across? Your personal ‘brand’? The genre or style of your writing? Something more specifically about your current book? Dates and times of forthcoming appearances? If your image is to contain specific information then make sure the important stuff is in the ‘safe’ areas of the image. Some of the resources referred to here will help you with that, or you can do it the old fashioned way – trial and error! 4) You can create a custom image even if you don’t have design tools like Photoshop. Check out Pixlr it’s a free online image manipulation software and easy to use. 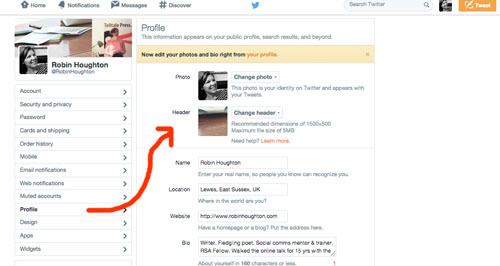 5) Follow the instructions from your profile or settings page, and save your new header image. If it doesn’t quite fit or look right, you can tweak it and re-upload. TIP: if you hit the ‘upload’ button but nothing happens, it could be that your image is too large (file size) or the wrong dimensions, or the wrong file type. You won’t always get a message telling you what the problem is. So if your image isn’t uploading double-check all the sizes and instructions about permitted file types (eg .jpg and .png may be permitted, but not .tif or .psd).